Appear from the 6th of King Hung, square glutinous rice cake to go abreast with national history and became the soul on New Year. The banquet tray welcome spring today, the green square glutinous rice cake makes it to the memory of square glutinous rice cake, kind of rice cake conception of the universe of the Vietnamese ancient . Square glutinous rice cake are made from materials rice, green beans, pork and wrapped in phrynium leaves… Cakes are made in the vietnamese traditional lunar New Year of ethnic and on March 10 th lunar calendar (the date of King Hung death anniversary). Who has experienced Year in old year (in 40-50 years of last century) often remember the traditional New Year with square glutinous rice cake of choice for any distillation from the phrynium leaves, a yellow kind of large grained glutinous rice, green beans and bamboo trip. Years of resistance against American military, to feed liberation army fight the enemy, the North’s people saved up all food for front line then Square glutinous rice cake is simply but value above all others because New Year only green square glutinous rice cake pan. For those who experienced New Year in the War, and also during the year subsidy, square glutinous rice cake pan distillation recall their hard memories, difficult, lack. Today, for those young people born in the second half after 80 decades of the 20th century, continue to cook cake on New Year seems just a ritual. 9X generation live in big cities seem to have no eager bustle feeling in Eve, warm gather-round cake pan with the family. Now, cakes for the Tet holiday purchased at supermarkets, shops or through the form of service provision. In countryside, flavor Tet still feel somewhat the adopt Tet cake pan. Air on New Year now no longer see the scene of her sisters all turned on the adjacent New Year, which washing phrynium leaves, soaked rice, soaked beans, scene kids eager to sit in facial view parent package cake, scene children and older looked after cake pan overnight, outdoor cold mist, frozen stiff not drowned warm air around the red cooking fire. For many generations, the square glutinous rice cake is of the joy on New Year together, reunion. The nice cakes, excellent square next to the display table is reserved for worshiping ancestors,small cakes package for small children as a gift early new Year… Tradition is still there, but few seem to no longer intact, a tool to cooked cake today replaced by pressure cooker or fire gas. Anyway to the New Year, spring, pictures of the square glutinous rice cake they remind each of us to value ethnic traditions. 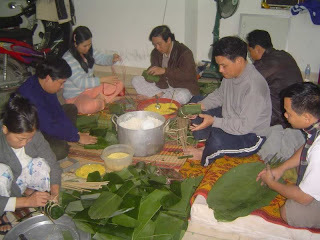 This time, the materials make cake were still: sticky rice, green beans, meat stuffing, phrynium leaves. Delicious cake to the actual material to prepare thoughtful, rice thoroughly soaking treatment, green beans cooked to done for a turn, meat including lean meat, packaging, skin, fat mixed enough spice, the finish package must be done immediately boiled new green cake. For the cake beautiful square, “overdone” package at the right “bean in the rice, the rice leaves, wrapping tightly hand without pressing the leaves still for saved long time, piece of cake after cutting beans, lean meat should always balanced for in all parts. Traditional New Year pictures of the green cake is traditional beauty of Vietnamese traditional culture. Shape through square glutinous rice cake, kind of rice cake , can not think of the meaning of the word “square circle” in vietnamese language. From the original concept of the primitiveness about birth, my ancestor have the first choice of two smart things symbol in ceremony to worship heaven and earth. Ancestor thought the harmony of the can: “empty” and “solid”, “square” and “circle”. But different “sun” and “land”, “man” and “woman”, they can be together and maybe the “heaven and earth developed everything” such as the teachings of Lang Lieu spirit. Square glutinous rice cake remind Tet or Tet remind the packed cake. 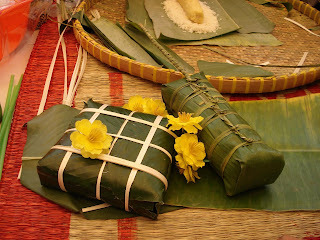 Perhaps, the combination become symbol of Vietnamese cultural – Square glutinous rice cake is a symbol for Tet. 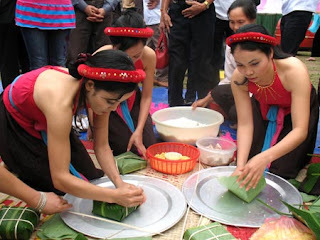 Thus, preparations package cake every New Year to have a beautiful customs in the culture of Vietnam.